Ask fellow campers about "Grants Pass KOA" and nearby attractions. Nice park easy on and off the freeway. The staff is very accommodating and eager for us have a great stay. The park is set in the woods and it gives you a real "camping" feel. 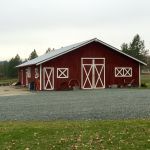 The sites are average spacing gravel and level. Some have patios. The sites are not in a line, this adds to the country feel of the park. our site was level and gravel. There was plenty of room for us and our tow vehicle. The interior roads are good. There is a creek and water falls at the park. We found it to be a good park and had a very pleasant stay. We will stay again when in the area. We camped at Grants Pass KOA in a Fifth Wheel. We stayed overnight on our way south on I-5. The staff were friendly and the campground was quiet and mostly empty, but we were staying on a weeknight in the shoulder season. We use a class B van but the site we got was very tiny in both length and width; there were other larger sites so perhaps because we have the van we got the smallest of all sites. Everything seemed well maintained and clean, but just a bit dusty since it was underused. Wifi didn't work at all, but we were camping right next to the waterfall and really far from the registration office so that might have something to do with it. I used T-Mobile service instead. We camped at Grants Pass KOA in a Motorhome. To put this review in perspective, we need to state that we seldom camp at KOA or private campgrounds. We prefer wilderness boondocking or state/federal campgrounds. We camp in a class B Travato. This campground has an outstanding location on a creek with swimming hole and waterfalls. Great outdoors experience. Sites were close together but that may be the standard for private campgrounds. The cabins and teepees were nice and the tent spaces had privacy fences. WiFi worked fine for us but, as usual for most camping areas, slowed later in the evening when more campers arrived. We were located close to the creek and waterfall at the lower end of the grounds and had sporadic cell service which improved once we walked up the hill a short distance. The KOA was spotless and the staff was beyond belief friendly and helpful. Definitely worth a stop if one does not mind close RV neighbors. We camped at Grants Pass KOA in a Motorhome. Well-stocked camp store with most every camping supplies, treats, ice, beer, wine. Very small but quaint and nice and friendly spot. We stayed here two nights and took a scenic jet boat cruise on the Rogue River, on a trip that was taking us towards Canada. It is a good two night place. We stayed in site #103 and if your 5th wheel is about 35-37 feet, and you like shade, #112 or #117 would be good too. There was a real nice grassy area right next to our site. We camped at Grants Pass KOA in a Fifth Wheel. We stayed two nights, and on our one free day we did a jet boat cruise on the Rogue River. A really great park if you are looking to get away - very woodsy and the waterfall and swimming hole are spectacular. Sites were spacious and spaced out well. I was assigned one with a patio, and had lots of privacy on 3 sides. The dog parks were fun, though someone was not picking up after their dog. But the rest of the grounds were great for my dog to explore. The goats and wild turkeys were charming. The staff was super nice and helpful. I opted not to use the showers, laundry or bathrooms. The wifi was good only if you want to check email or surf the web, not great at all for anything more than that. The site I was given was curved, so it made hitching up a little challenging. It is a bit of drive to get to any proper shopping or civilized amenities, and because of that, I did not stay more than a few days. As I said, great place if you want to get away and just relax. Would come here again when I'm in the area. 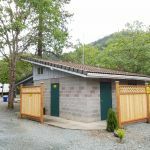 We camped at Grants Pass KOA in a Travel Trailer. Check out the goats and wild turkeys - not something you see at your average KOA! We were on the lower level near the waterfall and swimming hole. Nice. Great staff. We had a concrete pad but didn't see a lot that were concrete. Nice dog park up the hill and a small one on the lower level. Would stay here again. We camped at Grants Pass KOA in a Motorhome. Camped here in a 36ft MH for 5 nights, had site 116 and cabin CO1. Great: The setting is nice, farm-like/wooded/on a creek. The staff is extremely friendly. The grounds, facilities and cabins were very clean. Just ok: Dog park was big, dirt, clean. Power was stable. Hookups in decent location and in decent shape. Most sites had a lot of space, but laid out in a strange and sometimes difficult way. Nice views of the waterfall, but be advised it is a bit of a hike/climb getting down to them if you have difficulty getting around or need to carry very young ones. Playground is a sandbox, tiny jumping ring/innertube, tether ball, volleyball net, lots of dirt area to run around in. Bad: Water pressure! Lost pressure numerous times in both the cabin and the RV site (not even in close proximity of each other) reported this a number of times and was told they had problems with the well(s), would try to fix it and asked if we wanted a jug of water. Very hard to plan dish washing or showers with little to no pressure. A/C unit in cabin was worthless (but needed in the 90+ temps). Laundry too tiny for a park this size. The only restroom in our area had a toilet and a urinal and the urinal was out of order. Poor wifi. No cable, over the air tv or satellite view/access (one of the three would have been nice). Stovetop electric coil burners in cabin were so wonky you couldn't cook on them. Rollout window in cabin would roll out, but not back in. Did I mention lousy water pressure? We camped at Grants Pass KOA in a Motorhome. Henderson's Lineup in Grants Pass for suspension/braking/steering/towing work. The people working in the office are the friendliest we have come across. When we checked in they said: "Please let us know if there is anything you need. We want you to be happy." We stayed in a site that was billed as satellite friendly & it was. There is no cable. They recycle. The sites were level & the hook ups well placed. The water pressure was a little low. They had a large dog park that our puppies enjoyed, and there was a beautiful lawn in front of our site. The park is quiet. The layout is a little strange. It looks like they started out with one section and then added sites where they could find a space. They only have 2 washers & 2 dryers and they are located down by where the long term people stay. We would definitely stay here again. We camped at Grants Pass KOA in a Motorhome. We ate at Shari's, a coffee house type restaurant in Grants Pass. Good food. We ate there twice (lunch & breakfast). Elmer's, another coffee house type restaurant, was good, too. They are both off exit 55 on Interstate 5 on opposite corners of the main street. The decor at Elmer's was nicer but Shari's has excellent pie and is open 24 hours. Called Grants Pass KOA but is 11 miles North on town just off I5. Okay for a KOA. Friendly staff. No cable or OTA TV. No wifi. No pool. Sites level but part of park is on lower River level so a little challenging negotiating big rigs down hill road to lower sites. Upper sites on level ground. Park is clean and is quiet at night. Weak Verizon signal. Dirt and gravel roads so some dust. Water pressure low at times. I believe it is overpriced for what you get. We camped at Grants Pass KOA in a Motorhome. A bit of a drive to Crater Lake National Park from here but they did have an open space on Father's Day weekend. Stayed over Memorial Day weekend: mainly to be able to take a day trip to Crater Lake National Park (about a 2 hour drive one-way). Park is clean, staff was wonderful. Interesting layout. Sites range from plain to "garden sites," "deck sites," and the usual tent, tee-pee and cabin sites. Best KOA tee-pee sites I've ever seen. Usual KOA amenities but - no pool. Instead, a nice walk-way path down to a waterfall and swimming hole. Also no cable, very poor to no OTA TV reception and satellite reception could be difficult to impossible. The WIFI is very weak; at times could not connect at all; other times when connected too weak to do much but check email. For these reasons, I rated the value only 2 stars. Actually located about 10 miles north of the Grants Pass city proper. We camped at Grants Pass KOA in a Motorhome. Crater Lake National Park is a nice 2 hour drive. Wineries in the area. We loved this park, although it might no be for everyone. We only about 60 sites on 27 acres. Woods all around and a creek with a waterfall and swimming holes running through the park. Most sites were pull throughs that paralleled the roads. All had furniture and many had decks facing the woods with Weber BBQs. Lots of trees and shrubs. Very helpful staff and very clean. What some may not like are the crushed rock roads and RV sites and no cable TV (also no antenna reception because of the hills). Beautiful views in all directions. We will definitely return in the Summer. We camped at Grants Pass KOA in a Motorhome. Will be going back. Liked the lay out and the people were great. We camped at Grants Pass KOA in a Motorhome. We had a pull through site with a very nice deck with a grill. Very nice setting. The site was a bit tight to get into but it worked for us. We camped at Grants Pass KOA in a Travel Trailer. In the older section, preferred quiet to amenities. Was alone in a quiet area until a Class A rolls in with a pompous grump. Thankfully, he was appalled to be parked so close to a low-budget travel trailer so begrudgingly moved over one. Wifi terrible (better in new section I'm told). Giving high marks for the trees, grounds, trails, swimming hole, waterfall....and truly exceptional staff! We camped at Grants Pass KOA in a Travel Trailer. Nice "country" store. Walk down to the lower tier sites and sit by the creek and waterfall. Take the short walk to see the waterfall. Peaceful. 10 minutes to Grants Pass, where there are lots of good restaurants. Merlin is the closest town, we enjoyed bargain hunting at the thrift stores and trading post. By far the best is Merlin Bargain Center-if they don't have it, it probably hasn't been invented yet. Grants Pass is a beautiful town on the Rogue River with a National Historic downtown (walk the antique, thrift, and gift shops along 6th and 7th), and the weekly grower's market each Saturday. Quaint Grants Pass Pharmacy features an old time soda fountain where they mix their own phosphates. Eat and sleep we were just overnight. This park has charm and we will return. This park was named for the waterfall that is adjacent to it. We didn't have time to go see it but will for sure next time we are there. 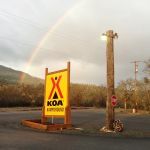 Are you affiliated with Grants Pass KOA ?